Happy October! My favorite month of the year is here and with it comes the 13 Days of Halloween challenge over at Simply B Stamps! The challenge kicked off today and the theme is to create your own spooky background. You can use any medium you like EXCEPT another digi image. As you know from my guest designer spot for SBS last month, I am not a fan of these types of challenges! They intimidate me for some reason and I freak out a little bit. But I really had fun playing along with the 13 Days of Halloween last year and I was not about to balk at the very first challenge! So here it is! The rules state that you MUST use a SBS image for the challenge. I colored up Broomstick Betty from the Teen Scene Trick or Treat Teens collection with my Copics. She is fussy cut and popped up with foam squares to give her some dimension on top of the scene. I decided to use ink to create my background a la Michelle Zindorf style. However, she uses a brayer to ink her gorgeous backgrounds and I don't have one so had to settle for sponges. I used Old Olive, River Rock, Pale Plum, Perfect Plum, Elegant Eggplant, Apricot Appeal, and Pumpkin Pie ink from Stampin' Up. 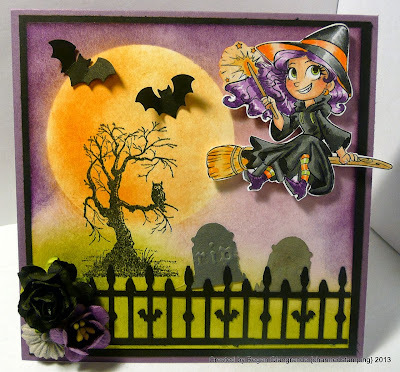 The creepy tree and owl are from a Stampin' Up stamp set called House of Haunts. I added a few punched elements (a wrought iron fence, gravestones, and bats) all from Martha Stewart as well as some flowers. The haunted house on the inside of the card is from the same SU set as the tree. Last year I blogged every day in October and had a new project to share each day. I'm not sure I can repeat that performance this year, but I do hope to play along in all 13 of Betty's challenges so that I can be eligible for the fabulous grand prize! For all the details about the SBS 13 Days of Halloween click HERE. Thanks for stopping by and hope you're having a fabulous week so far! We're just enjoying the season! We are all decorated for Halloween here and have been watching Halloween movies since Sunday! Markers used: Copics (E00, E11, E21, N4, N6, N8, R20, Y32, Y38, YR00, YR02, YR04, V09, V12, V15). 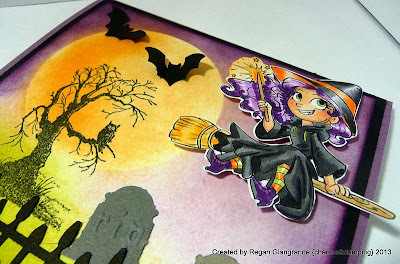 - Digi Darla's Challenges: DDC#82-Anything Goes with optional twist "Harvest Moon"
Fabulous card Regan. I love all the elements you used to make this an awesome card. That is an awesome background! Beautiful colors and coloring! YAY for the 13 days! A fantastic scene you've created here. Thanks for joining us at Craft A Scene this month. Amazing job on your background. The card is just perfect. 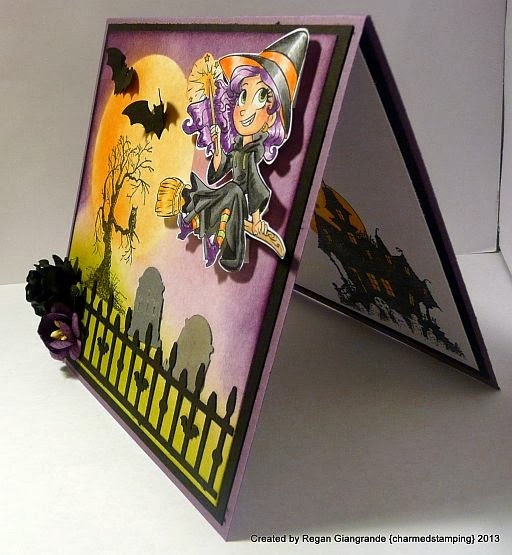 Great job and thanks for joining in the Simply Betty 13 Days of Halloween Challenges. What a darling card, Regan! I love your background--very awesome! Thanks for joining us this week at Through the Purple Haze Challenges! Fabulous scene! Love the moon and the tree and your great focal image. Thank you for sharing with us at Craft a Scene!! Reagan, I love what you have done with this card. Your coloring is phenomenal and that background rocks. Thanks for sharing your creation with us at Digi Darla this week. Super cute! Love the image and your coloring! Thanks for joining us this week at Created With Love Challenges for our HALLOWEEN Challenge! What a super cute card. Love the images and the fact that you did the inside as well.